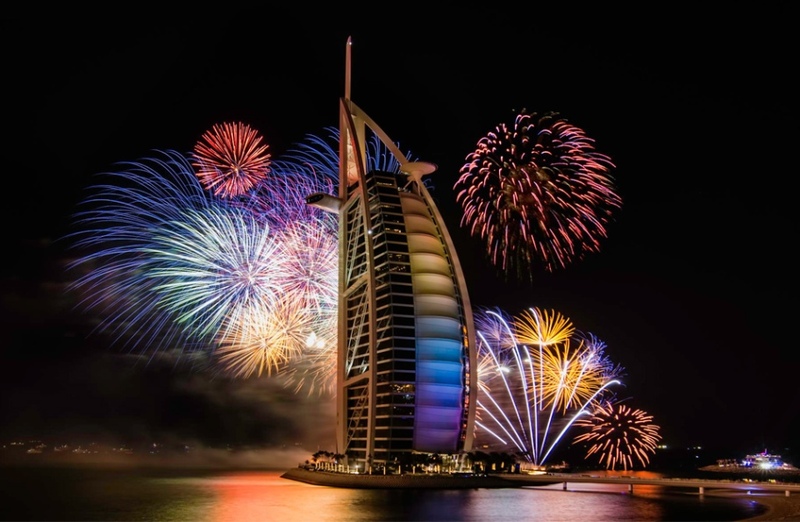 As one of the most dynamic and exciting places on the planet, Dubai certainly knows how to see in the New Year. In fact, over the past few years, the Emirates has established itself as one of the world’s prime spots for ringing out the old and ringing in the new, not least when it comes to its fireworks. Indeed, so spectacular is the midnight show here that last year it leapfrogged the likes of London, Sydney and New York to be named the biggest and longest firework display in the world. The centre of the action is at the world-famous Burj Khalifa luxury hotel. From here, tens of thousands of rockets soar into the night sky on the dot of midnight, with huge crowds watching on the streets below. Unsurprisingly given that Dubai is always moving forward, the 2015/16 celebrations look set to be bigger and better than ever. Alongside the main firework spectacular, the outside of the Burj Khalifa itself will come alive with hundreds of metres of LED lights, with the display synched to loud party music. So popular is the annual display that Dubai residents, as well as party-loving tourists are advised to get down to the streets surrounding the luxury hotel by 8pm at the latest if they want to get a good view of the action. Once the lengthy spectacular finally draws to a close, revellers are spoilt for choice when it comes to seeing in the New Year in style. For instance, the massive Dubai Media Ampitheatre traditionally plays host to superstar DJs and world-famous pop stars, though tickets for the biggest shows sell out several months in advance, so it’s always a good idea to book as early as possible. In 2014, for example, Pharrell Williams himself was on hand to lead the festivities, further boosting Dubai’s burgeoning reputation as one of the finest party spots in the world. For those seeking something a little less modern and a little more laidback, Dubai’s Irish Village opens its arms to New Year’s revellers throughout the night, with dancing and revelry going on until well after the sun rises over the Arabian Sea.